Leanne Hills interviews her grandmother, Enid Hills, the first female student at Massey. Growing up, we grandkids gleaned bits of my grandmother's story over weekend visits and summer holidays at Foxton beach. She told us of the lagoons and the black makatea [fossilised coral] of the Pacific island of Mangaia, where her father, Fredrick Christian, an Oxford-educated explorer and linguist, was the schoolmaster at the native school. We tried to picture grandma running barefoot with the local children, speaking their language, scrambling up trees. Then there were her memories of Massey, where she was the first female student; as I entered adolescence and dreamed of university she became my role model. She was a feminist 40 years before the tag became commonplace. At 92, Enid Hills carries her years lightly. As we talk she becomes 18 again, entering the halls of Massey on that first day in January 1932 to study poultry farming. Down at the main entrance they'd made a guard of honour out of farm implements to mark my arrival. My friend Jeff told me to go in the back way, she laughs. So Massey's first female student entered by the back door. On my first day in class, the men all stood up when I entered the room there was always plenty of good humour to go around. In March of '32, three other women joined Enid at Massey although she remained the only one studying poultry farming and once a term they were invited to an afternoon tea held for them by the wife of the Principal, Professor Peren. Nonetheless, the campus, with its combined roll of 191 students, remained overwhelmingly male. Enid never had a shortage of girlfriends from Palmerston North looking for invitations to dances at the refectory - the women at Massey were, after all, outnumbered by 50 to 1. The first woman to graduate from Massey with a degree was the remarkable Paddy Basset; her BAgrSc was bestowed in 1941. When MASSEY magazine caught up with her in 2000 she had recently been appointed an honorary staff member at the Wellington School of Medicine and was collaborating in research into connective tissue change. 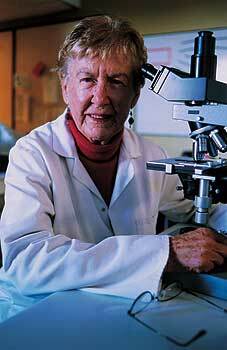 Paddy remains a strong member of the Massey alumni community, often attending functions. The gender imbalance also helped make rugby a major part of the college calendar. Football matches against Lincoln were always a bit of a bloodbath, she says with a hint of amusement. The course work itself was intensive, students working Monday to Saturday with little time for outside employment. Fees had to be met by families in the years before free education and student loans, and many students worked on farms over weekends and holidays. 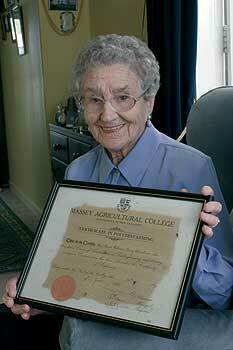 At the end of the 48-week course, Massey found a job for Enid managing a poultry farm at Whenuapai, north of Auckland. Massey needed to prove that their courses were as strong on practical matters as theoretical, which was a concern amongst the wider community, Enid explains. What better way than to have their first female poultry farmer out there walking the talk? It was the heart of the Depression. I was 19 years old, a slip of a girl wearing jodhpurs and brogues, she recalls. And she had arrived in a poor rural community which viewed college diplomas with understandable scepticism. But I knew I could cope, says Enid. Massey had prepared me well. The area had just had the electricity put on, but shortly after I arrived the power got cut off. Supply still wasn't very reliable. The next-door neighbours, with 200 milking cows the town's supply needed all the help they could get. When Enid pitched in with her hand-milking skills, picked up during her course, word got around. She earned her stripes as a great milker and stripper. In those days [stripper] referred to getting the last milk from the cow, Enid is quick to add. During Enid's four years at Whenuapai the farm thrived and she enjoyed a warm relationship with the owners. She twice won prizes at the Papanui National Egg Laying Competition, her studies in breed selection at Massey proving indispensable. She left to return home to Palmerston North, where she would work as a journalist for the Manawatu Times. In 1938 Enid married teacher Lincoln Hills. Over the next three decades the couple would have four children while living in a variety of rural communities. Enid's knowledge of farm accounting and animal husbandry would often prove useful. At the age of 67, two years after her husband died, Enid became a Justice of the Peace and marriage celebrant always up for a challenge and ready to learn new skills. What have been the chief influences in a very full and still highly active life? Her father, she says, is one: he raised Enid and her siblings to be free thinkers, gave them a classical education, and endowed them with a sense of wonder in the world. The other, she says, is her time at Massey. I see education as the staff in your hand, she says. It's how you use it.